Manufactured from Stretch water-repellent fabric, ensuring the user is kept dry. Highly visible trousers due to the Hi-vis yellow reflective insert. The Enlarged back tail increases the users protection against water. Designed with Back ventilation, providing a very comfortable user experience. The Chest pocket is very handy for holding valuables whilst at work. Water repellent 2-way strech FREEDOM 2 fabric. 93% polyamide, 7% elastine - 240 gm outer fabric. Water repellent 67% polyester, 33% coton outer fabric - 250 gm. 9 layer Arm, Shoulder and Chest protection to EN 381-11 with additional Belly Protection. 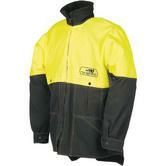 Portwest CH10 Chainsaw Jacket is ideal for chainsaw users because of the protection that it provides. It can be used with Portwest CH11 or CH12 garments for all over protection. This comfortable jacket is also water repellent, breathable and has a mobile phone pocket and adjustable Velcro cuffs for a secure fit. Complies to EN381-5:1995 Class 1, Type A, 20 m/s. Made using 65% Polyester and 35% Cotton. Chainsaw jacket matching the green Innovation range. Robust PA/COT outer fabric for an excellent durability. Provides protection on the arms, chest and shoulders in accordance with EN 381-11. Ergonomic design with ventilation on the back to provide optimum breathability and comfort. Zip closure, short and straight collar. 2 inset pockets with zip closure, 1 patched smartphone pocket with zip closure on the left arm. Sleeve narrowing by press studs. Elasticated waist, Back- and underarm ventilation, Elongated back tail. Fabric: Shiny water repellent 45% Polyamide - 55% cotton fabric ±240g/m2. Water repellent 67% polyester - 33% cotton outer fabric ±250g/m2. The Dickies Industry 300 Vest is constructed from a rugged and durable 300gsm polycotton fabric. Perfect for working in many different industries including construction. It includes a YKK zipper with full length storm flap and covered poppers, 4 large pockets, action back and 34 reinforcing bartacks. Dickies Industry 300 Two Tone Vest is made from 65% Polyester and 35% cotton, 300 gsm fabric. Modern design, fitted size and top range materials are the key features of this superb garment. Made for the outdoor activities, provides optimal protection against cold and wind, thanks to the integrated windbreaker in the front and back. Long zip pullers for easy access even wearing gloves. Elastic at end of sleeves and Elastic drawstring in hem. Fixed windbreaker lining in front and back. Fabric: 100% polyester double sided fleece 285 g/m². Sioen 611Z Durango Men Two Tone Fleece Jacket conforms to: EN 14058:2004 / Class 1.x.x.x.x EN ISO 13688:2013. In this category you can find a range of our hand selected Chainsaw jackets suitable for chainsaw and forestry work. We provide the best products from the best brands. 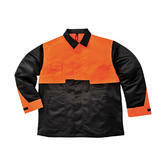 These jackets contain pads of cut-retardant material designed to reduce the risk of injury to the body in the event of contact with the rotating chain. The fibres in the jacket offer extra layers of material and are designed to rip apart when they come into contact with the rotating chain and to clog the sprocket and stop the chain. SIP Chainsaw Jackets 1SI5 is one of our highly recommend jackets, it provides superior protection whilst working around chainsaws. The entire jacket is designed to protect against chainsaws (arms, chest, shoulders). Safety Standards met by various Chainsaw Jackets: EN381. Not what you?re looking for? Then why not check out the our full range of Chainsaw Protective Gear or our entire Catalogue!